Snapshot: American SUV giant Jeep has been testing its Ford EcoSport competitor in the Fiat 500X’s body shell for many months now. The deception is now history as the body shell camouflage has now been lifted with Jeep adopting a more butch look, in line with the design language of the SUV brand. 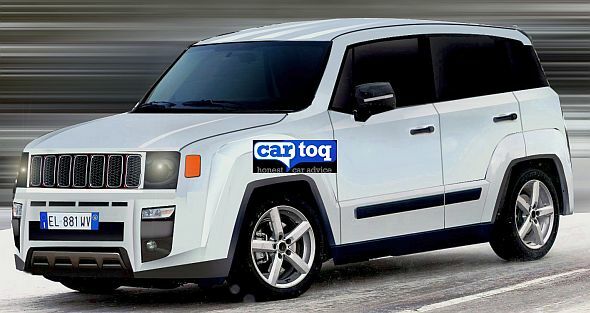 Based on the latest crop of Jeep Laredo spyshots, CarToq has rendered the B-Segment compact SUV, one that is slated to eventually land on Indian shores. The Jeep Laredo Compact SUV is based on the US Small Wide platform, the same platform that underpins the Fiat 500X crossover as well. The Laredo will be built alongside the Fiat 500X at the Italian automaker’s Meifi factory in Italy. The Laredo will be the least priced SUV in the Jeep brand, and is aimed at increasing volumes for the American SUV brand in both emerging and developed car markets across the globe. In terms of price and positioning, the Jeep Laredo will take on the Ford EcoSports and the Nissan Jukes of this world, in the B-Segment SUV space. Given the Jeep badging on the SUV, off road ability will be a major focus area of the new product. So, a four wheel drive system is likely to be standard on the new offering. The petrol and diesel powertrains that powers the Laredo will be borrowed from the Fiat 500X crossover. The Jeep Laredo will make its international debut in the second half of this year. Fiat-Chrysler India’s Nagesh Basavanahalli has told CarToq that the Jeep plans for the Indian market, albeit delayed, are definitely on. In that light, expect the B-Segment and C-Segment Jeep SUVs to eventually be launched here. The Jeep B-Segment SUV could arrive into India sometime next year, at a price of under 10 lakh rupees.